GoCardless is a payment gateway that allows you to collect both one time and recurring payments, including via Direct Debit. You can use GoCardless within Operate's Portal via our integration, which allows you to easily install and configure it. This will make it easier for your customers to: pay invoices (one time or on a recurring basis), book your space or register for your events. Our GoCardless integrations are available under Settings > Integrations > Payment Processors. If you are implementing GoCardless for the first time and you have never installed it within Operate, then you will only see GoCardless v2 in your integrations list. Easier Setup - The configuration has been simplified, in comparison to the first version. The ability to use different GoCardless accounts for different Operate Organizations - With the first version, it was only possible to integrate one GoCardless account, regardless of how many Organizations you wanted to use it for. It is now possible to use separate GoCardless accounts per Organization. This makes the new integration especially beneficial if you are managing your business using different legal entities for different buildings and you therefore need a separate payment process for each of these entities/buildings. Regardless of whether you are a new or existing user, please install the GoCardless v2 app, by clicking the 'Install' button next to it. To reiterate, you will find the app in your Operate Settings > Integrations > Payment Processors. Once installing GoCardless v2, please open the app by clicking the Open button that shows up on your screen. On the Welcome screen, click Start. Next, click Configure, next to the Organization you want to configure GoCardless for. Your Currency Code - GoCardless only accepts GBP (British Pound) or EUR (Euro). Your Access Token - You will need to retrieve this from your GoCardless account. Please read the dedicated section below to learn more about the needed steps to retrieve it. Tick Use Sandbox if you want to do a test run first. To do this, you will need a GoCardless Sandbox account, which is separate from your regular one. You can sign up for the sandbox here. Dave your settings when ready. Your Portal will now accept payments via Gocardless tor the Organization you have configured it with. To set it up for another Organization, simply follow the same steps once again. When configuring next, you can either use the same GoCardless account or a different one, depending on your needs. Go to Developers, on the left side menu. 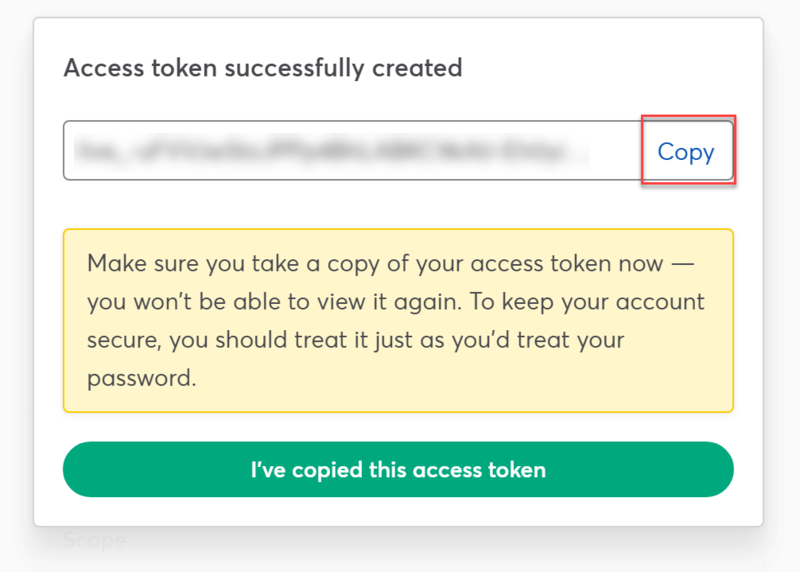 Click Create an Access Token. 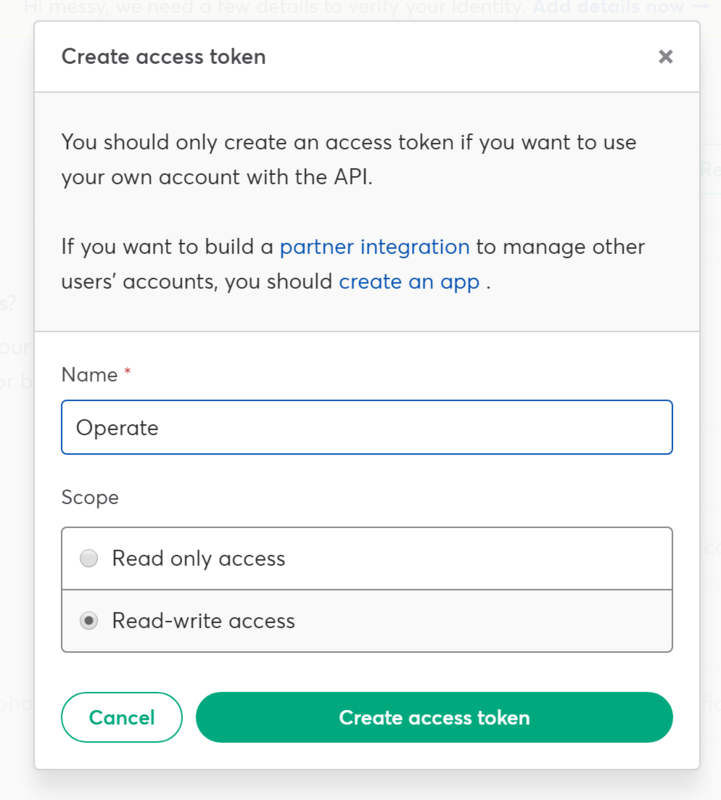 Name your Token as 'Operate' and allow it Read-write access. You will now see a screen that displays your Access Token. Please copy it now — you won't be able to view it again. To keep your account secure, you should treat it just as you'd treat your password. To test your GoCardless setup, we suggest making an invoice for £1 in Operate on a test account. Create a test account and then a contact for the test account, making sure to enter an email address. You can then email your test contact a portal invitation, to set up a password and be able to log in. Login to your Portal as the test customer, go to My Account > Invoices and pay for the £1 invoice you just created. Go through the check out process and make sure that you can successfully make a payment. NOTE: If your payment fails, please check the Setup steps again and make sure they have all been completed. One of the main benefits of using GoCardless is that you can action your own Direct Debit run. When customers pay an invoice through the Portal with GoCardless, they will get an option at the point of checkout to enable recurring payments. If they choose this option, it means that you are authorized to debit payment for any outstanding invoices that they have from your organisation. When a customer authorizes recurring payments, a token will be stored in the Payment Token field on their account. You can go through recurring payment collection using the same GoCardless integration and by following the Recurring Collections Guide.